Pre cook pasta to al dente, drain and set aside. Heat the olive oil in a large skillet over medium heat.Add the garlic and cook about a minute or two. Add the marinara sauce and cook in medium heat for 5 minutes. Add shredded basil and reserve. In a mixing bowl, stir together ricotta, mozzarella, parmesan, egg, salt and pepper until thoroughly combined. Pour 1/2 cup of the marinara sauce into the bottom of a shallow 8-inch by 8-inch baking dish. 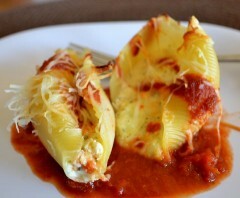 Stuff each pasta shell with a generous amount of the ricotta mixture and place in the baking dish. Cover with the remaining sauce and bake for 10 minutes. Serve warm with a dusting of Parmesan.